Click here to read this post in Spanish! Haga clic aquí para leer este blog en español! Snake fangs are specialized, elegantly modified teeth. Some are like hypodermic needles, others are more like water slides. But all serve essentially the same purpose: to inject venom into the snake's prey. Occasionally, the fangs are also used in defense, but studies show that snakes striking in defense are far less likely to inject venom than when they're striking at a prey item, a fact that has assuaged the fears of many an ophidiophobic. I wanted to write a brief review of snake fang types, because their anatomy is very interesting and also because of their important role in classifying snakes and understanding how different groups of snakes are related to each other. F is an aglyphous tooth. G is an opisthoglyphous fang. H is a proteroglyphous fang. I is a hollow solenoglyphous fang. This most sophisticated fang type evolved once, in the ancestor to all modern vipers, which lived in Asia about 40 million years ago. Fossils suggest that solenoglyphous fangs have changed little since that time, even though vipers have undergone an incredibly successful radiation into 320 extant species found on all continents except for Australia and Antarctica. Solenoglyphous fangs are long and tubular and are attached to the snake's maxillary bone. 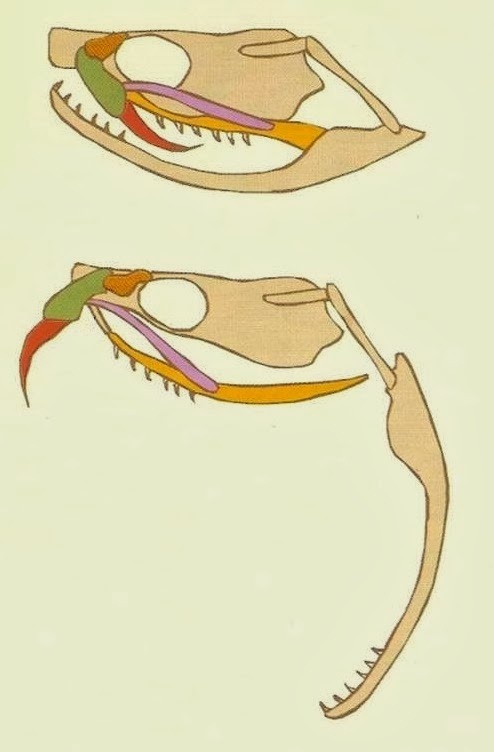 Most snakes have several tooth-bearing bones, including four (the premaxilla, maxilla, pterygoid, and palatine) in the upper jaw, and one (the dentary) in the lower. In humans, three of these bones (the premaxilla, maxilla, and dentary) also bear teeth - your premaxilla holds your top incisors, while your maxilla holds your upper canines and molars and your dentary all your lower teeth - while the others form part of the roof of the mouth. In vipers, the maxilla bears only a single tooth (the fang) and is hinged so that the fangs can be folded back parallel to the jaws when the mouth is closed, or erected perpendicular to the jaws, the position when striking. The teeth in the pterygoids and dentaries work together to manipulate food once it gets into the mouth. Solenoglyphous fangs are strikingly similar to hypodermic needles. They have a hollow core that receives venom from the venom gland at the entrance orifice near the base and injects it from a slit-like exit orifice on the front of the fang near the tip. If the opening were at the very tip of the fang, its strength would be compromised and it would lack the sharp point needed to penetrate the target. Even under normal use, vipers shed their fangs every two months. A similar fang type evolved a second time about 29 million years ago in a group of African snakes, currently placed in the family Lamprophiidae, subfamily Atractaspidinae. Two genera, Atractaspis (mole vipers, burrowing asps, or stiletto snakes) and Homoroselaps (African dwarf garter or harlequin snakes), possess elongate anterior fangs, although only those of the stiletto snakes are movable. Stiletto snake fangs pivot on a socket-like joint that is more flexible than those of vipers, allowing these snakes to strike beside and behind them with their mouth closed. This is an adaptation to living underground and envenomating small mammals and other reptiles in narrow subterranean burrows. The fang morphology of atractaspidines and viperids is remarkably similar, considering that these two snake lineages last shared a common ancestor over 40 million years ago. (Dendroaspis angusticeps). Don't try this. This fang type also evolved only once, in the ancestor to all modern elapids, which lived 25-40 mya in Asia or Africa. Proteroglyphous fangs are in the front of the mouth and are about three times shorter than solenoglyphous fangs. This is because they are not hinged. Snakes with proteroglyphous fangs typically strike their prey and hang on until the venom has taken effect, as opposed to releasing they prey and then tracking it down. Some elapids constrict their prey at the same time as envenomating it. Over 350 species of elapids exist today, including well-known groups such as cobras, mambas, death adders, taipans, coralsnakes, and sea snakes, and less-well-known species, mainly found in Australia, of which a good number are small, secretive, and not considered dangerous to humans. rear of the maxilla. This line may be obscured in longer fangs. Unlike solenoglyphs, some proteroglyphs have other teeth on the maxilla behind the fang. However, the fang is always separated from the other teeth by a gap, called a diastema. Some elapids have more than one functional fang on each side. In both vipers and elapids, there are usually at least two fangs on each maxilla at any one time, one that is in use and one that is a reserve fang. Both fangs are draped in a layer of connective tissue and skin called the fang sheath. Some proteroglyphs have partially movable fangs, including many of the most dangerous species such as mambas, taipans, and death adders. A few, such as spitting cobras, have modified exit orifices to their fangs that are smaller and rounder than in other cobras, a modification that increases the velocity with which venom is ejected. Modifications to the muscles and the fang sheath also facilitate spitting in these cobras. A few elapids, such as sea snakes that eat only fish eggs, have lost their fangs and their venom glands, which suggests that the primary role of venom, at least among elapids, is in feeding rather than in defense. These are commonly known as "rear-fanged" snakes. Opisthoglyphous fangs are grooved rather than hollow and are found near the back of the maxilla, behind the normal teeth. 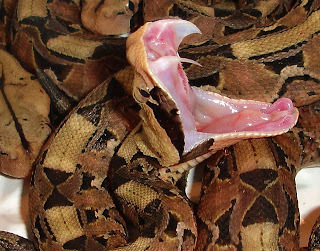 Typically, snakes with rear fangs must chew on their prey to bring their fangs into a biting position. 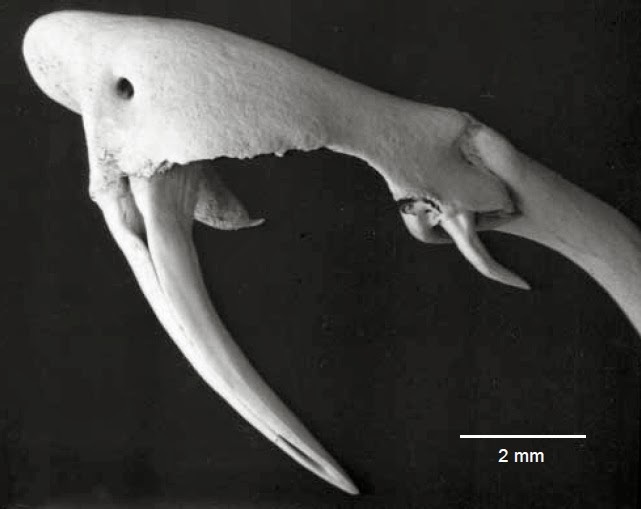 There is considerable variation in the size, shape, and number of opisthoglyphous fangs from species to species, and sometimes even within a species. Most opisthoglyphous fangs are connected to Duvernoy's glands, which differ from true venom glands in several important ways, most notably in that they lack associated muscles to generate the pressure needed to evacuate venom, as in solenoglyphous and proteroglyphous snakes. 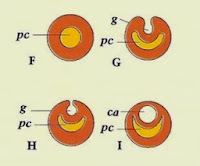 The pressure on the venom glands of biting solenoglyphs and proteroglyphs can exceed 30 psi, the pressure of a car tire, whereas the pressure inside the Duvernoy's glands of opisthoglyphs is generally less than 5 psi. Because Duvernoy's glands also lack a chamber for storing venom, the idea is emerging that opisthoglyphous snakes probably secrete their venom only during chewing, which explains why prolonged bites by opisthoglyphs generally have more severe effects. Most of these snakes are not harmful to humans, with a few notable exceptions. Boomslangs and Twigsnakes are arboreal, diurnal African colubrines that prey on lizards and birds. They have short heads, rear fangs situated comparatively close to the front of the mouth, and partially muscled Duvernoy's glands. They also have potent venoms and their bites have killed several people, including two prominent snake biologists, Karl Schmidt and Robert Mertens. 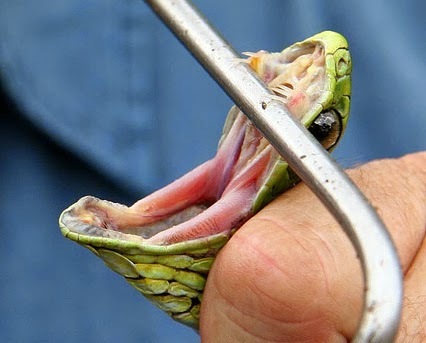 Bites from other rear-fanged snakes are known to cause relatively mild, transient, and local symptoms, but clinical documentation of these bites and their effects is scattered, incomplete, and frequently anecdotal. Many are written by the victim themselves! The above notwithstanding, bites from opisthoglyphs are generally less medically important than those from proteroglyphs and solenoglyphs. As a result, snake venom research has not focused on them, so there is still much that we do not know about this group of snakes, some of which are becoming increasingly common in the pet trade. Based on what little we do know, the composition of opisthoglyph venom/Duvernoy's secretion is fairly similar to that of viperids, elapids and atractaspidines, which makes sense given that each of these groups is more closely related to certain opisthoglyphs than they are to one another. The f marks the portion of the maxilla where the fang develops. Unlike the first two groups, opisthoglyphous fangs appear to have evolved more than once, in snakes as diverse as Quill-snouted Snakes, Neck-banded Snakes, and Boomslangs. At least, that's what we used to think. Actually, it is likely that both solenoglyphous and proteroglyphous fangs evolved from opisthoglyphous fangs, as revealed by an ingenious study that used evidence from embryology and genetics to reveal the evolutionary origins of the three types of snake fangs. 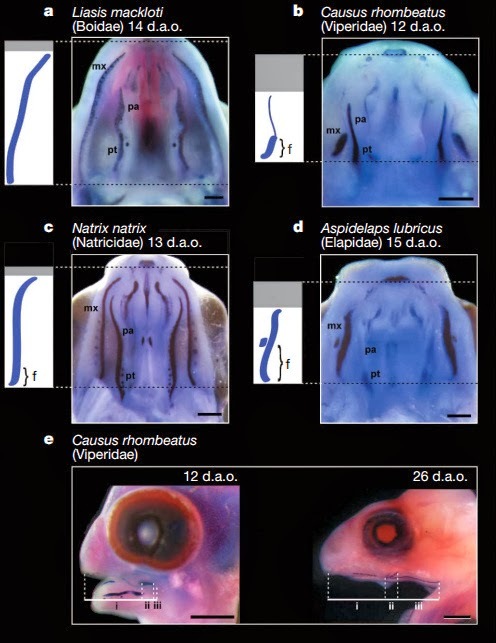 In a snake embryo, tubular fangs are formed by the infolding of ridges on the front and back sides of the fang, such as those that form the groove of opisthoglyphous fangs. Furthermore, front fangs develop from the rear part of the upper jaw, and are strikingly similar in their formation to rear fangs. They are pushed into the front of the mouth by disproportionate growth of the initially small part of the maxilla that is behind them. 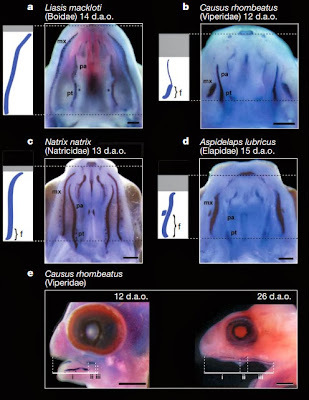 Finally, in the anterior part of the maxilla of front-fanged snakes, expression of a gene called sonic hedgehog, which is responsible among other things for the formation of teeth, is suppressed. 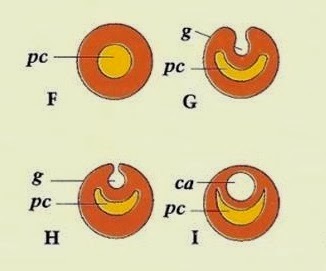 Although developmental similarity is not conclusive proof of structural homology (similarity due to inheritance rather than due to other factors), these findings are consistent with the hypothesis that solenoglyphous, proteroglyphous, and at least some opisthoglyphous fangs are homologous structures. 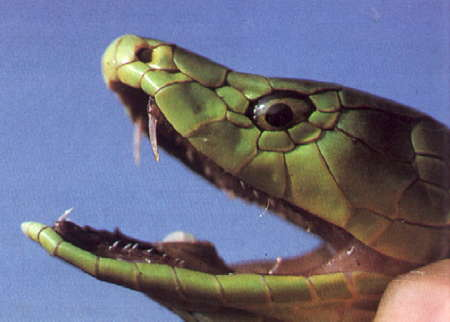 The hypothetical evolutionary trajectory was thus: some snakes evolved grooved fangs in the rear of their mouth. 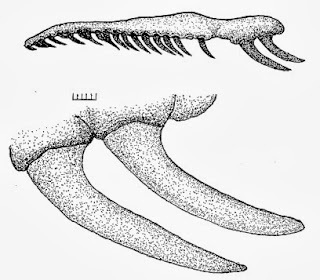 In a few cases (viperids, elapids, and atractaspidines), they subsequently lost the preceding teeth as what was formerly a rear fang became a tubular front fang. Other snakes retained their anterior teeth (at least some non-front-fanged colubroids), and still others developed fangs but then lost them (aglyphs such as ratsnakes). Evidence for this surprising final part comes from the formation of the maxilla and its teeth, which takes place in a single piece in pythons, but from two pieces in all fanged snakes as well as in ratsnakes, a pattern which supports a single evolutionary origin and subsequent loss of fangs. Additionally, vestigial Duvernoy's glands have been found in ratsnakes, egg-eaters, pareatid slug-eaters, and other nonvenomous aglyphs, a discovery that has led to the misleading generalization that all snakes are venomous and much subsequent misunderstanding among the non-scientific community. Toxic saliva does not a venomous animal make, as evidenced by the fact that even human saliva injected subcutaneously will produce pain and swelling. the only thing this film got right. This word is used to describe unmodified teeth, essentially non-fangs. All snakes, even those that possess fangs of the first three types, have aglyphous teeth which they use for gripping their prey as they manipulate it during swallowing. 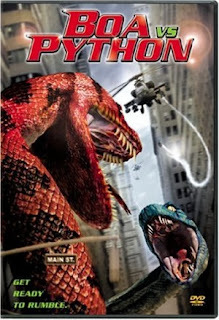 As I just mentioned, many advanced snakes that today have only aglyphous teeth probably evolved from fanged ancestors. Several of these snakes, such as North American kingsnakes, ratsnakes, and bullsnakes, have atrophied Duvernoy's glands that lack toxin-producing serous cells. These snakes employ other sophisticated techniques, such as constriction, which is also used by more primitive snakes like boas and pythons (which did not evolve from fanged ancestors). There are very few dangerous species of aglyphs, but one, Rhabdophis tigrinus, is becoming well-known as one of the only snakes capable of sequestering toxins from its prey for use in its own defense. This species has enlarged posterior maxillary teeth that lack grooves, so they are by definition aglyphous. 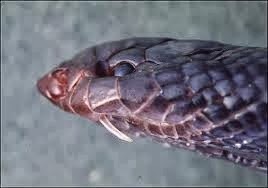 However, it has relatively potent venom and has caused the deaths of several people. Among colubroids, the distinction between opisthoglyphs and aglyphs has never been entirely clear, but I'm distinguishing between them here because they are two of the four traditionally recognized types of snake teeth. Although the four types of snake teeth in this article are commonly discussed, a more accurate classification for snake teeth might be to divide them into tubular (the fangs of viperids, elapids, and atractaspidines), grooved (the rear fangs of non-front-fanged colubroids), and ungrooved (all other snake teeth). Happily for snake biologists like myself, the evolution of fangs opened the door for a massive evolutionary radiation of advanced snakes (>2800 species, or >80% of all living snake species). Although sophisticated venom delivery systems, of which fangs are just one of many integral parts, were clearly evolutionary advantageous, they have obviously also been costly at times, leading to their loss in ratsnakes, egg-eaters, and other lineages of advanced snakes. Also worth noting is that many lineages of basal snakes have got along just fine without venom, so there is not an inherent superiority of being venomous as the word "advanced" seems to imply. Rather, some have suggested that during periods of transition from forest to grassland, such as that which took place simultaneous to the dramatic colubroid radiation during the Miocene, snake taxa that were characterized by slow locomotion and constriction (boas & pythons) were supplanted by those characterized by rapid locomotion (many aglyphous colubrids) or passive immobilization (tubular- and grooved-fanged vipers, elapids, and atractaspidines that could use venom to catch their prey). Of course, both slow locomotion and constriction have subsequently been re-evolved among the colubroids, but there has been a lot of time since the Miocene. Thanks to Daniel Rosenberg (boomslang fang) and Nick Kiriazis (hognose fang) for use of their photographs. Weinstein S, White J, Westerström A, Warrell DA, 2013. 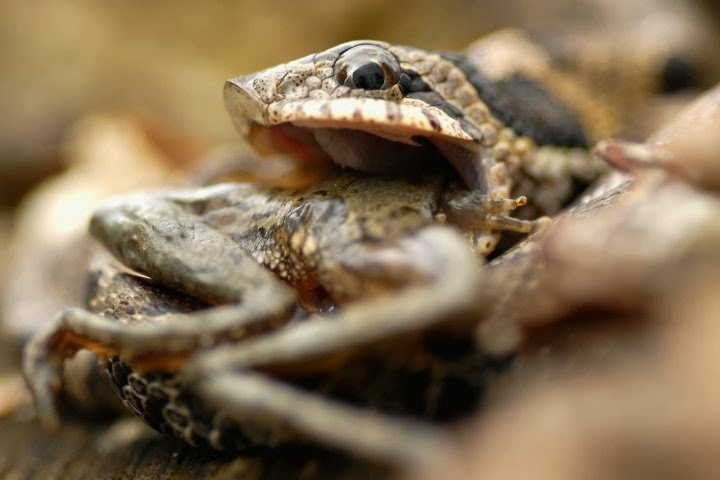 Anecdote vs. substantiated fact: the problem of unverified reports in the toxinological and herpetological literature describing non-front-fanged colubroid (“colubrid”) snakebites. 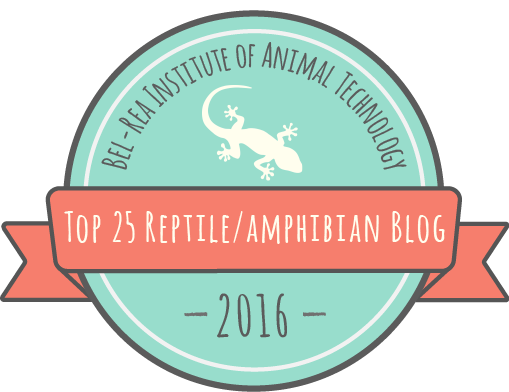 Herpetological Review 44:23-29. I loved it. Here is my favorite paragraph: "Additionally, vestigial Duvernoy's glands have been found in ratsnakes, egg-eaters, pareatid slug-eaters, and other nonvenomous aglyphs, a discovery that has led to the misleading generalization that all snakes are venomous and much subsequent misunderstanding among the non-scientific community. Toxic saliva does not a venomous animal make, as evidenced by the fact that even human saliva injected subcutaneously will produce pain and swelling." Thanks Jeremy. There's definitely a difference between 'dangerously venomous to humans' and 'technically descended from venomous ancestors' that is important to make in communicating about snakes. Even many snakes that are dangerously venomous aren't actually all that dangerous, either due to their disposition (sea snakes), the remoteness of their range (taipan), or the high quality of the medical care available where they occur (copperheads, cottonmouths, and rattlesnakes). It's not that anyone should advocate being incautious with these snakes so much as that fear of them is way out of proportion to the actual risk. It's something we humans are very bad at estimating. Brilliant! I live with these buggers here in North Eastern Australia basically daily, but do not know enough about them. Thanks for keeping this article somewhat accesible to your average Joe. I came here to answer a simple question and happily read through till the end after finding my answer in the first paragraph. For the record all snakes are intriguing beautiful creatures. Except for king browns, sneaky cranky bastards they are. Said the scared human of the misunderstood creature : ) still, browns are the only snake that scares me and I remove at least a dozen snakes of various breeds a year from my home. I'm so glad to hear you found your answer and that you found the rest of the article interesting and accessible! That's my goal. It must be challenging to live around so many venomous snakes. I'd love to get out there someday and see Australia's snakes firsthand. Don't hesitate to write with snake questions: amdurso@gmail.com. You're right! I'm not sure where I got that number, could be a typo. Sorry about that! I'll make an edit right away. Really helpful. Thank you sir. You cleared all my doubts about snake fangs and their structure and types. Thank you very much.